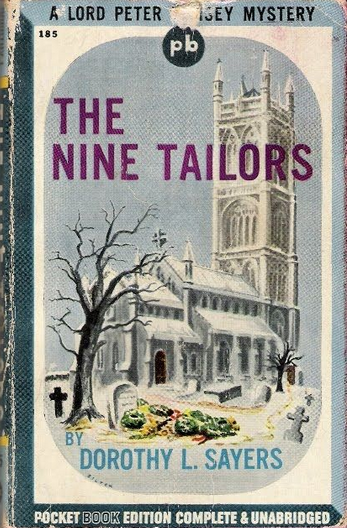 The orderly, Church-centric English countryside in the 1920s isn’t someplace I should by any rights feel nostalgic for, but reading The Nine Tailors, a great mystery novel written in that time period by a feminist intellectual and devout Christian, makes me so. Naturally, suspicious behavior ensues during the bell-ringing, leading to a murder and an investigation for Wimsey, but the real heart of the book is the church, its bells, and the lovingly detailed portrait of English religious life in a small town in this era. Let’s pause for a moment to contemplate church bells, which before telephones, internet, etc., were a system of public address. Each bell had a distinct sound which the population at large was likely to know, and depending on which one was rung and how many times, messages could be communicated. In this book there’s a bell called Tailor Paul and rung nine times it means someone has died, thus, “The Nine Tailors” of the title. As the mystery unfolds we see the central role of the church in village life and during emergencies—it’s on high ground and everyone including Lord Wimsey literally lives there for weeks during a flood. I’m a secular American in a polarized country (in a polarized world), and I can only imagine a society centered on a shared public space of a church, with a deeply habitual sense of shared ritual, where religion provides a code of good behavior and most of the local entertainment, and where this seems like that would be pleasant instead of terrifying. Elsewhere I believe Sayers has referred to the Church of England as “the great compromise,” and the sense of religion bringing people together instead of dividing them is palpable. I’m fairly certain the beanfest is meant to be funny, as are the tea-urns. I’m a social person, a blogger, a PTA mother, a charity volunteer and I often feel lonely in those roles; reading about England in the 1920s I think, Oh, I would have been active in the Church, and that would have been fun. I’m sure there are people who will say, “you still can,” but I’m hopelessly on the other side of the culture wars for religion today. Which makes this kind of mystery novel a lovely escapist pleasure, and a new favorite of mine in the Sayers oeuvre. Hi, Valerie. I also really enjoyed this one, which I remember rather vaguely now (except for how much I liked it) because it was some time ago that I read it. One of the things I liked the most was the amount of research I could sense on the subject of bell-ringing and its techniques and involvements. Of course, that’s one thing that all the Dorothy Sayers novels and stories I’ve read have, a real sense of time and place based on solid research and good imagination. I think she shares that quality with another great dame of English mysteries, P. D. James. So you seem to have read a lot of Dorothy Sayers without being crazed with love for Lord Peter Wimsey the way I am. How do you do it? Oh, I have my crush on Lord Peter, it’s just been a while since I indulged it. I rarely read mysteries these days, perhaps a fault in my reading plan. Maybe I’ll embark on a re-reading of Dorothy Sayers sometime soon. Lol. I re-read them every few years. But you don’t have to! I used to love to read but now work… too much. I went to work at 7 am and returned at 10 pm. Well, that’s not everyday but I share that to note how it’s enjoyable to read a real review (not having time to read the book) as you draw out interesting points and give the reader a sense of things. Your comment about bells and public spaces before internet is spot-on. I grew up in a Presbyterian church in the 60s and 70s – it was a gift to have such a sense of community. Your review reminded me of this. Thanks. Thank you for getting it! It’s slightly more difficult and more time consuming to write a post that pulls out the interesting parts of the book so the reader gets the fun of reading the book…. without actually having to read the book. It’s easier to just rant about my opinion. But sometimes I spend the extra time, so thank you for noticing! Wish I could get paid to do this. What are you, doctor? OTR trucking? No time to read is a tragedy! I head up communications for a large environmental company that operates lots of public and private assets – from drinking water to district energy services for major cities to hazardous waste. Keeps one on the go… thanks for replying back. Yes, I get it and it’s obvious from the many comments you receive that you do a great job so it seems that most indeed get it! Wish I could advise you on how to turn this into a paid gig… it’s clear that you have a talent with language. Peace.